Sometimes it can be a struggle to put a wholesome dinner on the table. While I spend a fair amount of time in the kitchen, developing traditional foods recipes for this site, I spend even more of my time in my office – hands on the keyboard, and eyes glued to the display. Work, coupled with never-ceasing family obligations like doctors appointments, play dates, and extracurriculars means that sometimes, aspire as I might for something better, I throw something in a pan for dinner and pray it turns out. It’s on these evenings, rushed and tired, that I lean on my homemade seasoning salt to enliven otherwise tired and dull dinners, and to provide a punch of flavor quickly. Rather than relying on commercial salts, which can contain additives that I’d rather not feed my family or eat myself, I favor using something homemade, with a combination of flavors that I happen to really care for. It only takes about five minutes to pull out the salt, herbs and spices I happen to like, to whir them together in a spice grinder, and pour the resulting homemade seasoning salt into a little jar. I set it in the spice rack next to my stove, and it’s always there for me in a pinch. 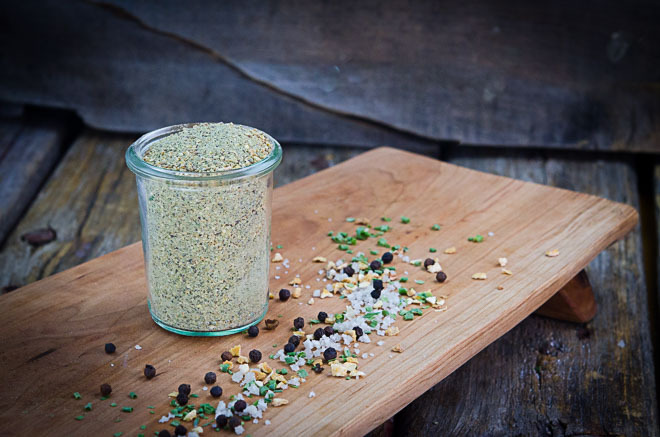 Homemade seasoning salts add a lovely, and quick, punch of flavors to dishes when used either in cooking or as a finishing salt. Pay attention to which flavors you tend to use most frequently in your day-to-day cooking, and mix together a ready made salt that’s available when you want it. In much of my day-to-day cooking and weeknight meals, I tend to favor salt, pepper, lemon, chives and parsley – particularly when flavoring light foods like chicken or fish. At other times, I gravitate toward rich and smoky flavors like chipotle chile, smoked paprika and smoked salt. Having a few jars of ready-made seasoning salt helps me to flavor those last-minute weeknight meals in an instant. Below, I’ve included my recipe for my favorite seasoning salt which includes unrefined sea salt, smoked black pepper, chives, parsley, lemon peel and a punch of dulse, a mineral-rich sea vegetable. Making seasoning salt at home is less about cooking, and more about ratios. Good questions to ask might be which flavors you prefer, and how dominate you want those flavors to be. My friend Heather over at Mommypotamus, whips up porcini mushroom and bacon seasoning salts. You can use homemade seasoning salts and finishing salts in similar ways. When you’re cooking, you can sprinkle some of the homemade seasoning salt into the food as it cooks. When I make my easy roast chicken, I first begin by coating the chicken with olive oil (find organic olive oil here), and then I sprinkle it generously with my favorite homemade seasoning salt (recipe below), and then I place it in the oven where it roasts until the meat is tender and the skin wonderfully crisp. Using the salt more judiciously, you might simply sprinkle a touch of seasoning salt over whatever it is you happen to serve for dinner. Perhaps sprinkling Tarragon and Wild Mushroom Salt over a homemade risotto just before serving it. I favor unrefined sea salt in my kitchen, and use mineral-rich Utah salt (find it here) for most purposes. Not only is it affordable (compared to other specialty salts), but is is particularly rich in trace minerals that contribute to the lovely speckled pink color of the salt as well as adding a small amount of minerals to my family’s diet. I also purchase both culinary and medicinal herbs in bulk online a few times a year from this company that specializes in a huge variety of organic and wildcrafted herbs and spices. If you have a good-sized herb garden, you can dry your herbs and use them to flavor your homemade seasoning salts as well. 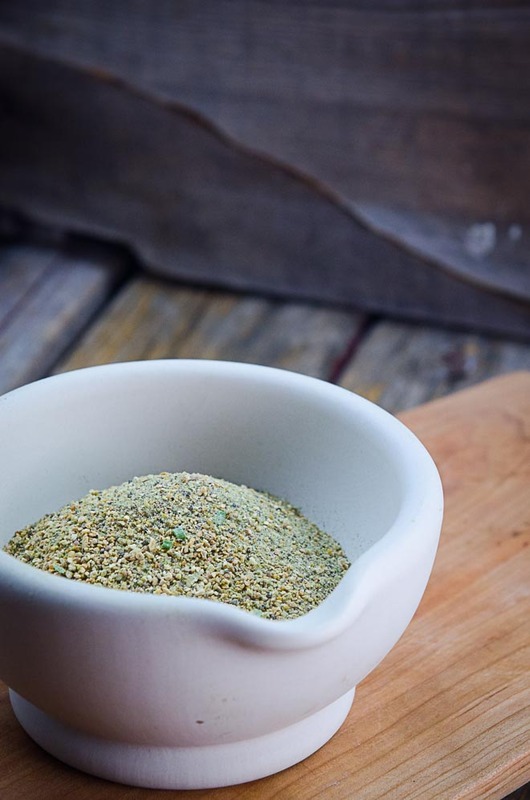 Nice to have on hand for flavoring meats, fish or grains in a pinch, this homemade lemon chive seasoning salt is one of my favorites - combining some of the flavors we use most frequently in my kitchen: salt, smoked pepper, lemon, chives and parsley. It is particularly nice sprinkled over chicken. Pour all the ingredients into a medium-sized mixing bowl and stir until well-combined. Then, working in batches, place all ingredients into a spice grinder (Click here for the one I use.) or into a the pitcher of a high-powered blender, and process until they form a fine powder. Transfer the seasoning salt to a glass jar or other container, close the lid tightly, and store in a cool place for up to one year. I had to look up Dulse Flakes. This is what I found on the website: Don’t overdue, and avoid it entirely if you suffer hyperthyroidism. You only need a few flakes, or as little as a quarter-teaspoon a day, to get your mineral needs, and it is best to get your minerals from a variety of whole food and whole herb sources. Don’t use on a daily basis for more than 2 weeks at a time, taking a 2 week break before using again. This will prevent you from overdosing iodine with potential imbalance in thyroid function. For periodic use only and not to be taken for extended periods of time. Not to be used while pregnant. Hi Barbara, I don’t think it’s valuable to post precautions. If I did, nearly every ingredient would come with a precaution. Any person who is suffering from any particular disease (such as hyperthyroidism – which I had, and blessedly overcame) should speak with their health care professional about which foods they should eat or not eat, as the case may be. The above link is likely looking at the medicinal use of dulse, which is not what we’re looking at here in the recipe. The recipe contains 2 tablespoons of dulse, and that means that if you season a dish with 1 tablespoon of the seasoning salt – enough to feed 4-6 people, each person would eat a relatively minuscule amount. Traditionally, dulse has been used as a primary food source for thousands of years – notably in Ireland and Scotland where eating dulse-based soup is still traditional, as is eating dulse on festival days (ex. yellowman and dulse). So, as always: know your body, and its needs and eat accordingly. Now this was sooo simple but really a lifesaver! I have purchased the premade seasonings from Trader Joes in the past ‘occasionally’ but generally steer clear of anything I don’t make myself. But in the hustle and bustle of my busy life it just never occurred to me to make my own seasoning in bulk, duh! Thank you for the idea and for sharing your recipes… they are right up my alley! It has never occurred to me that I could make my own sea salt! Wish I was closer to Utah to get some. I was told by a Dr. that I actually needed to consume more salt for my thyroid! That my iodine levels were extremely low. My favorite here is the Rosemary Garlic ~ eager to try! I made my seasoning mixes without salt, then people can finish their serving with the amount of salt they need or want. I have always cooked real foods, eat mainly a vegetarian diet, raise my own organic vegetables, fruits and herbs and use of lots of spices. Since I like Asian, Mexican and Mediterranean foods those are the mixes I usually keep on hand. I have found I like whole spices better for their flavors and keeping qualities. Having a spice grinder on hand makes the mixes fast and easy, plus the house smells great. Your blog is always interesting, thanks. Do you have any suggestions on purchasing a grinder for herbs? Mine broke recently and not sure what is a good purchase for a new one, thanks. Hi. My husband just got diagonised with diabetics and I need to start or changing his eating habits do you have any cookbooks out there you would recommend, or do you have one yourself? Any suggestions on foods? Thank you for this – I’ve needed to do this forever!